Happy Halloween, dear readers! My, your costumes look lovely. Here, have some candy. 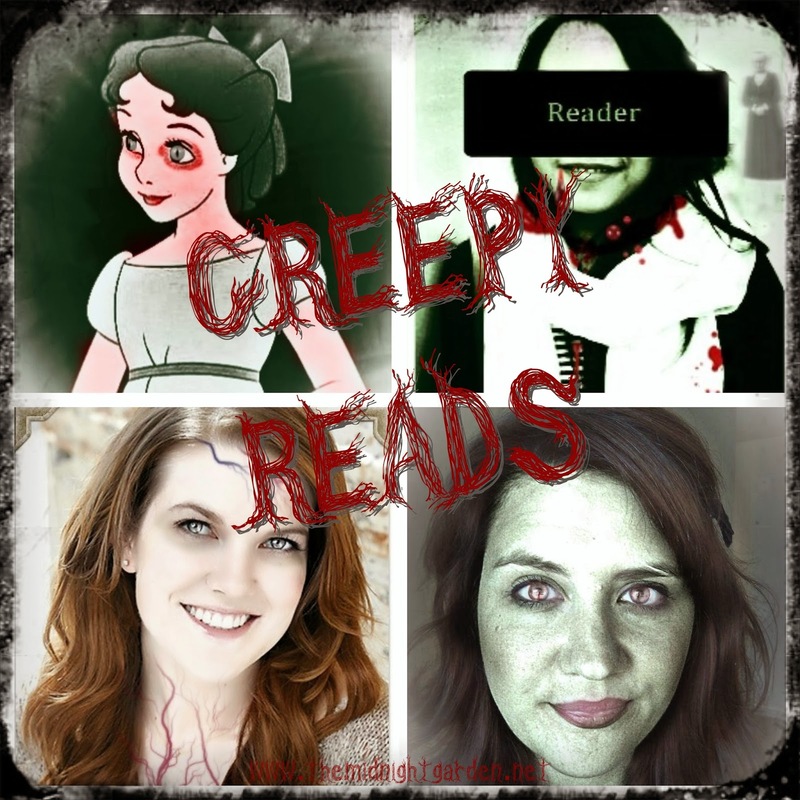 Today we’re sharing our favorite creepy reads with you. Our tastes range from connoisseur of creep to scaredy-cat, but none of can pass up a well-written book–even if some of us may need to read it from the safety of a blanket fort. Keeping reading to see which sinister stories we recommend this All Hallow’s Eve. For someone who rarely likes horror movies, I really enjoy well-written horror books. I don’t necessarily find a lot of them scary, though–as much as I like Stephen King or zombie novels, the books I find really creepy are the ones that evoke a feeling of unease or are terrifying in the power of their suggestion. I don’t bat an eye at bloody bodily violence, but describe a creaking sound in the attic or imply that the heroine might be going mad, and I get crazed with nervous excitement and fear. Affinity and The Little Stranger by Sarah Waters aren’t specifically horror books, for example, but they both were permeated with a pervasive sense of dread as well as moments that raised the hair on the back of my neck. Marcus Sedgwick doesn’t write typical cookie cutter YA horror novels either, but White Crow was pitched at such crazy intensity that it practically gave me heart palpitations, and Midwinterblood had some wildly romantic and savage imagery that I loved. 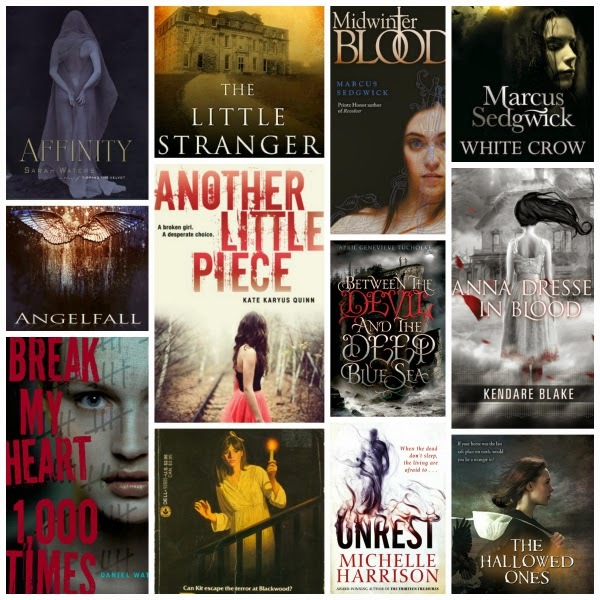 Some of my favorite traditional YA horror books include: Anna Dressed in Blood, a screamingly intense read that made me want to sleep with the lights on; Another Little Piece, Between the Devil and the Deep Blue Sea, Unrest, Break My Heart 1000 Times, The Hallowed Ones, Angelfall, and The Waking Dark. I also need to include a special shout-out to YA classic Down a Dark Hall, which was probably the first gothic horror novel I remember reading, and is still one of my favorites! 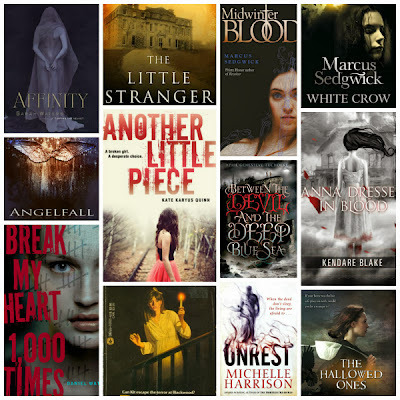 I like a lot of horror books, but those are some of the ones I’ve found the scariest in recent memory. Here’s my very small “scared the crap out of me” shelf on GoodReads, and you can find more books on my deliciously creepy bookshelf all year long, too! I love Halloween. I hate scary movies. I’m terrified of ghosts. I like post-mortem photography. That’s me in a nutshell. Despite these contradictions, I do not make conscious effort to read horror stories. However, as a reader, it is inevitable that you would at some point unwittingly pick a book that will instill chill after chill after chill on both flesh and bone. These are mine. Coraline by Neil Gaiman — This has, I think, become a staple in middle grade literature because Gaiman knows how to write for children. Never underestimating his young readers, Coraline is sinister and sad, ominous but heartfelt. A little girl, neglected by her parents, discovers a mysterious door that opens into another world, where she finds her “other” parents and many wonderful things — until the wonderful turns wicked. This has proper creepy quality. We Have Always Lived in a Castle by Shirley Jackson — Oh, the classic. This is more psychological horror than one relying on the senses. It is not noises and shadows that scare but secrets and what we know our protagonist isn’t telling. It’s about Merricat, a strange girl who lives in the big mansion on the hill and about her one terrible and terrifying secret. The Thirteenth Tale by Diane Setterfield — This is an adult contemporary Gothic about a book shop owner’s daughter called upon the residence of the reclusive Vida Winter asking her to write her biography, into which the famous novelist is finally ready to confess all her secrets — and what great and frightening ones she has. It is a twisted, disturbing and absolutely gripping tale of death, words, family, murder, love and loss. Recommended to all. One last one — Final Exits by Michael Largo. This is a “plus” book because it’s not fiction. Rather it is a dictionary of the many natural and bizarre ways people have met their ends. It’s gross, weird, paranoid-inducing but, yes, at times, funny. Enjoy. This was a hard list for me to narrow down. I started with 40 books, then narrowed it down to 20, and then finally decided that nine was the lowest I could possibly go. I’m sorry about that. I hardly ever read truly scary books (I get legit terrified—like little kid scared—especially with ghosts, and that’s no fun for me), but most of my favorites are at least vaguely unsettling, so that’s the tone of a lot of these. Anna Dressed in Blood by Kendare Blake is one of my favorite books released in the past few years. It’s creepy and wry, with the casually beautiful language we might have seen in Buffy the Vampire Slayer, had Neil Gaiman ever written an episode of that show (WHY DID NEIL GAIMAN NEVER WRITE AN EPISODE OF THAT SHOW?). The Passage by Justin Cronin is absolutely terrifying. In it, the government has been experimenting on death row inmates, turning them into enormous vampire-like creatures. When they break out of the facility where they are being kept, they spread across the world infecting or killing billions of people, and one little girl is humanity’s only hope of survival. This series is dense and literary, and the cast of characters, which spans several generations, can, at times, be hard to keep track of. It’s so worth it, though. Undead by Kirsty McKay is such a delight of a scary, hilarious story about a zombie outbreak on a school field trip. I reviewed its sequel, Unfed, here last week. Neverwhere by Neil Gaiman was a tough pick for me, because, frankly, my entire list could have been comprised of his novels and short stories. But this was my introduction to him as a solo author ( read Good Omens, which he wrote with Terry Pratchett, first), so it seemed best to give it the spot on this list. This story started out as a BBC mini-series, so it falls a little flat on the page; I’d recommend listening to either the audiobook, which Gaiman narrates himself, or the BBC radio version, which stars James McAvoy, Benedict Cumberbatch, Christopher Lee, and a million other crazy talented actors. Affinity by Sarah Waters is one of those books that I’m incapable of talking about without putting my hand on my chest like an emotional old lady. It is haunting and heartbreaking and absolutely perfect. Feed by Mira Grant is about bloggers during the zombie apocalypse, and it is the first book in one of the best science fiction series I’ve ever read. Midwinterblood by Marcus Sedgwick is a seriously creepy story about a pair of lovers who die and become reincarnated over and over again, and I… I just… Creepy. So, so creepy. The Golden Apples of the Sun by Ray Bradbury: I could really list any of the collections of Bradbury’s short fiction here, but I chose this one in particular because it was in an edition of this that I first read The Fog Horn, a story about a sea monster that falls in love with a lighthouse. This story haunts me, and I think about it at least once a week. At the Mouth of the River of Bees by Kij Johnson is a compilation of the author’s award-winning science fiction and fantasy short stories. They are so, so, so good. You can read the unsettling “26 Monkeys, Also The Abyss” and several others for free on the author’s website. I see I’m the only scaredy cat of the group. As a kid, I read almost exclusively creepy stuff–Stephen King, Dean Koontz, Christopher Pike, etc. But as an adult? Well, suffice it to say I have to sleep with the light on after some Supernatural episodes. So. If you’re looking for creepy-lite? I’m your girl. House of Leaves by Mark Z. Danielewski. This might be more mind-f*ck than actual creep, but it gave me quite a few shivers up the spine while I read. I’m finding it almost impossible to summarize, but basically a slightly crazy young man finds a draft and an academic study on a documentary called The Navidson Record, where a family moves into a house that seems to shift and expand while maintaining the same shape on the outside. It’s quite an intense and convoluted read, but interesting. And very creepy (in my opinion.) More info on its wikipedia page. Heart-Shaped Box by Joe Hill. One of the only legitimately scary books I’ve read in the last few years, it tells the story of has-been rock god Judas Coyne, who has an affinity for collecting the macabre. When he’s told of a ghost being sold on e-Bay, he snatches it up right away. Only to be haunted by the vengeful spirit, driven to the brink of madness while everyone around him dies. Joe Hill is, of course, Stephen King’s son, and he’s definitely inherited his father’s creeptastic skills, with a hint of Neil Gaiman’s story telling ability as well. Cabinet of Curiosities by Stefan Bachman, Katherine Catmull, Claire LeGrand, and Emma Trevayne, which will be published in May 2014. What started as weekly themed short stories has now blossomed into a full-length book featuring “40 Tales Brief and Sinister.” The original stories can still be found online here, and the Kindle pre-order for the book (which has a GORGEOUS cover) is only $1.99 right now! So what books send a shiver up your spine? Who’s Your Bookish Kindred Spirit? Wow! You gals are brave! I’m always hesitant to read creepy books. They linger longer than movies. I’m quite a wuss myself, but I absolutely loved Angelfall, Coraline, The Thirteenth Tale, Anna Dressed In Blood and The Hallowed Ones. I have to say I found that one and its sequel, The Outside, quite creepy! I have Another Little Piece already in my TBR list, can’t wait to read it! Pili recently posted…ARC Review of A Study In Darkness by Emma Jane Holloway! Great lists, ladies! Thanks so much for sharing. I HATE being scared or creeped out. Midwinterbllod is one of the only truly, spine-chillingly creepy books I’ve read that I completely enjoyed. It’s nice, isn’t it? I have only read half the books here myself, so I got a lot to add to my list. I’m such a wimp. I get scared so easily. I want to read these but always end up picking something a little… lighter. I feel you. I’m especially wimpy about ghosties. They creep me out. You have named almost every single one of my favorite creepy reads, and the ones I didn’t know? I will soon! :) Thanks for the recs!! I’ve only read half of the books on this list, and I’ve read NONE of Tonya’s picks! That’s the fun thing about writing on a blog with a few other people; we have such varied tastes, so I get exposed to a lot more than I woudl discover on my own. So many awesome looking picks that I now have to check out! I have read 4 of Wendy’s picks I think. I just picked up Another Little Piece. Cabinet of Curiosities sounds oo so interesting I must look into it! I have Another Little Piece, too, although I haven’t read it yet. It sounds soooooo good! Great recommendations! I feel like I’m so bad with creepy books, though I do love the Anna series by Kendare Blake. I didn’t realize Angellfall was going to be creepy! But I’ll probably still read it haha. I would recommend The Diviners by Libba Bray. Angelfall has some SERIOUSLY scary bits, but I’m pretty much a weenie, scariness-wise, and it didn’t freak me out, so you’re probably fine. So many awesome titles! I would really suggest reading Darren Shan’s Cirque Du Freak books ;) So creepy! Thank you! Adding them to my list! Awesome picks, gals! I am so happy to see Midwinterblood here TWICE, and Anna makes a pop up appearance as well! AND THE HALLOWED ONES! Win win win!! Thank you, Lyn! Anna! Midwinterblood! …and I haven’t read The Hallowed Ones yet because it seems so legit creepy. “I don’t bat an eye at bloody bodily violence, but describe a creaking sound in the attic or imply that the heroine might be going mad, and I get crazed with nervous excitement and fear.” YES. After awhile it blood and guts get repetitive and you become desensitized but eerie and haunting never get old :) I love how ANNA made two lists, that book is amazing. Anna is crazy good. And I agree with Wendy, too–I’m not so much into the blood and the gore. I’ll have to look into Affinity if both Wendy and Kate thought it was creepy! Never heard of it and I love being creeped out! Anna Dressed in Blood is a great choice! Kate, I NEED to read the Feed series as everyone raves about it. I do love zombie tales. I totally agree with your inclusion of The Hallowed Ones, Wendy! A scene from the basement still sticks in my mind. Eeeek! I need to read the sequel soon. Affinity is one of those books that kind of defies description. Whenever I tell someone about one of Sarah Waters’s books (this one included), I inevitably tear up. They’re just so lovely. And YES, FEED. Get on that. Chop-chop. What a great and comprehensive list-I see a few I’ve read, some that are on my to-read list, and a bunch that I need to check out! I’m not usually into scary reads but I want to expand my reading horizons. I have read hardly any of the books on the other ladies’ lists. There is just SO MUCH out there to read! I doubt generally read horror, but I did enjoy Anna Dressed in Blood. Anna seems to be the great equalizer, scariness-wise. It’s just so good! I’m kind of a horror-novel newbie (I think I’ve read relatively tame scary stories, since none of them seemed all that bad), but I was thinking about trying Anna Dressed in Blood. It sees to be on everyone’s top ten spooky reads. I’m not big into scary books (or scary anything, frankly), and Anna really scared me, but in a good way. Like, I was scared while reading it, but I slept fine in the dark afterwards. I still haven’t read ALP, although I’ve owned it for months. I think you will LOVE Anna. So, so good. Yay, I’m glad you guys featured FEED it is one of my favourite books ever. 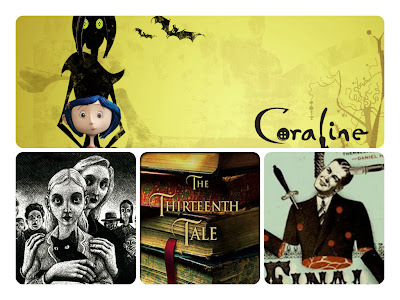 Anna Dressed in Blood was a great creepy read and so was Coraline! Love FEED. Love, love, love. And Anna. And Coraline. 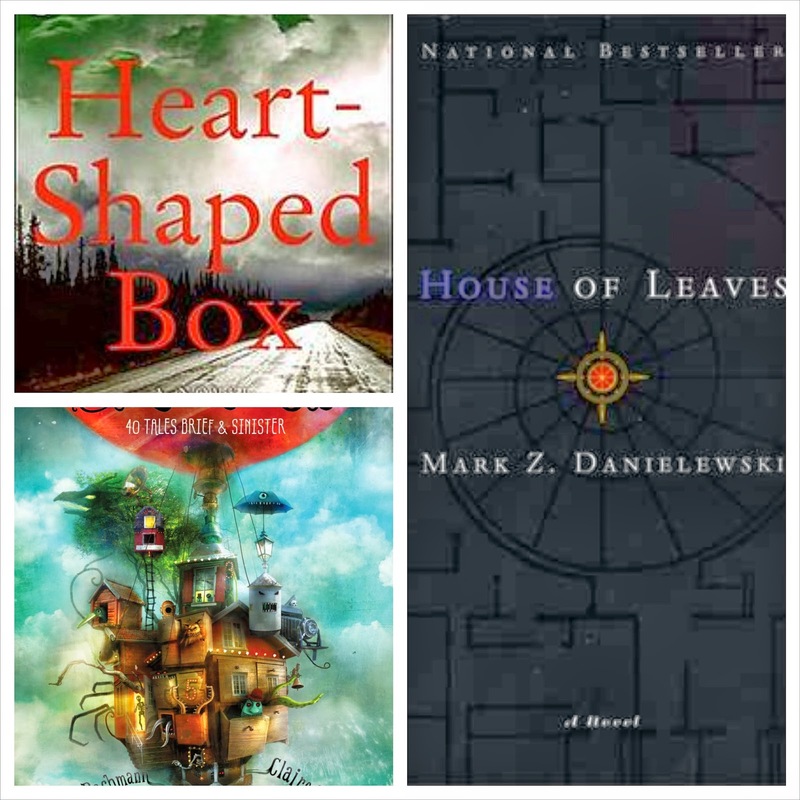 I must be a horrible horror reader because I’ve only read one of these on your lists! (Although, I’ve always wanted to start Anna Dressed in Blood.) The one I read is from Tonya’s list “House of Leaves” which my brother made me read after prodding for a solid week. It messed with my head! You literally feel like you’re going crazy while reading it. Definite mind f***, for sure. Anna and its sequel are both very, very good. You really should read them as soon as possible. Ooh so many, many awesome books to add to my ever growing list! thank you! I LOVED The Thirteenth Tale! It’s probably one of my favourite books I’ve ever read, actually. I have her next book lined up to read, and although most people I know didn’t like it quite as much, I’m hoping for at least an enjoyable read. Ooooh, ladies! Such awesome, creepy lists of books. Some I’ve read and loved, and some I’ve never heard of. (Incidentally I hadn’t heard of WE HAVE ALWAYS LIVED IN THE CASTLE until today – first I read a review of it, then I saw it in this post!) I’m definitely headed to Goodreads to make sure some of these books end up on my TBR! Read the rest, Molli! Make us feel important. I hadn’t heard of the Shirley Jackson book either, but boy does it sound like something I’d love, too! I need to read that Bradbury story, too–he’s one of my favorite authors, though I haven’t read as many of his novels as I’d like. He attended the high school down the street from our place, and went to the same library we go to every day after school, so a few years ago before he died, he did a talk and signing there, which was just amazing. One of the few author events I sought out, and one of the few authors who would ever render me speechless. I used to go to Bradbury’s birthday party at Bookfellows in Glendale every year, and one year he took a picture with me. I lost the picture. I’m pretty upset with myself over it. I know, it always surprises me when people say they don’t find Anna scary–I mean, SHE FLOATS DOWN THE STAIRS COVERED IN BLOOD. *whimper* Clearly they are made of stronger stuff than I am, hah. Glad you loved Hallowed Ones, too. More people should read that one. I still haven’t gotten to Hallowed Ones. Mostly because I’m a scaredy cat. Oh, lots of good books I haven’t read! (Only a few I have. Although I must admit to liking Anna Dressed in Blood but not really finding it *creepy*.) I do love a good creepy read. Hah, see–I think Blythe and Mel from Finding Bliss also rated it rather lowly on the creep factor on their Halloween month post, while I thought it was insanely evocative. Everyone’s scare factor is so different! I hope you enjoy some of our recs anyway, though. Anna seriously creeped me out. Man. Really, really, really seriously. Anna Dressed In Blood and Angelfall are so creepy! I love those books. YAY for The Hallowed Ones love! That book is so fantastic and way too few people know about it. Another Little Piece and Between The Devil and The Deep Blue Sea are on my TBR, perhaps I should bump them up. I haven’t read any of these but they sound fantastic, I’ve had my eye on Coraline for awhile now. EVERYBODY SHOULD READ FEED! Plus a Good Omens rec? Way to name two of my favorite books. I’m going to check out the rest of these ASAP because we clearly have overlapping tastes. Heart-Shaped Box sounds amazing. Ghosts being sold on ebay? That kind of wackiness speaks to me, I’m in. I have to caution you that both ANOTHER LITTLE PIECE and DEVIL are kind of tricky–they’re both over the top in terms of story and emotional pitch, but I loved the madness running rampant in them! I hope you will, too. Yeah. You, like Wendy, are one of my book soulmates. According to Goodreads, we are 78% compatible (Wendy and I are 90%). I definitely prefer over-the-top creepy reads as opposed to truly scare-i-fic reads (because I’m a massive chicken. That’s why.). Bawk bawk. ;) It’s funny how everyone has such different taste in horror–some things I think are scary don’t even register to other people, and obviously vice versa. I wonder what deep twisted things in our psyches shape our thresholds for horror. Say what? It’s part of the curriculum now? Impressive! Ahh I love your Halloween pics–creepy much and Happy Halloween ladies! I studied Coraline at school this year and wow, I learned so much from what I thought I could have when I read it the first time. Also have to write an essay on it next week! Nooooo. We’re so DECREPIT. :D Happy Halloween, Mel! And wow, you’re reading CORALINE in school? That’s amazing. 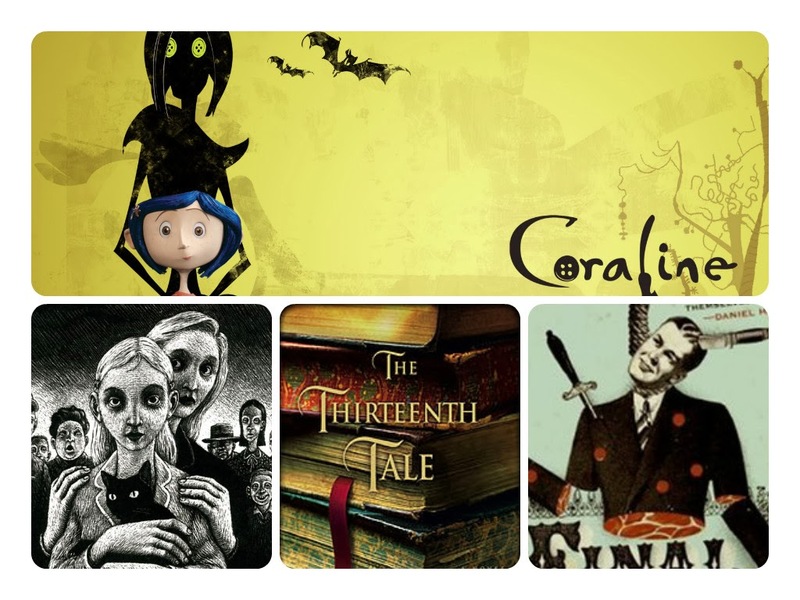 I am fascinated by Coraline as a school read because the movie is pretty accurate. Wendy with blood in her eyes! I love the creepy pictures colleague. Happy Halloween to all of you! K- Caroline is one of my favorite stories ever, so frightening. Hee, I’m glad you like the ghastly version of ourselves, Rachel. Happy Halloween! I only read Anna Dressed in Blood (which I found incredibly scary especially when that guy-whose-name-I-forget first saw Anna descending from the stairs) and Angelfall (I didn’t know what you found creepy about it and then I remember the kids and the mutilated bodies and, um, okay). Definitely going to check out the rest of these books. The Hallowed Ones is already in my TBR and hopefully I can get around to reading it soon. Yesss that scene was crazy good. Hah hah, yes, that was the scene was thinking of for ANGELFALL–it doesn’t have too many real horror scenes, but the ones that were there were doozies. HALLOWED ONES is excellent. I’d heard all the great buzz about it, but was still skeptical–but it turned out to be a really riveting read. The sequel is terrific, too. I need to read Midwinter Blood – it sounds lovely. These are some spectacular book reccs, ladies. Thanks! MIDWINTERBLOOD is so creepy and gorgeous. I think K is reading it right now and enjoying it, I hope you do, too! Thanks for stopping by. I recommend it as well. I was very impressed after Wendy recommended it and was nice enough to send me a copy. It’s a very beautifully written book. I literally just finished Anna Dressed in Blood about an hour ago. It was FANTASTIC. I haven’t actually read any of the other ones. I know, I know, I need to read more scary books. Angelfall has been on my to-read list forever and Barns and Noble finally released it as a nook book, so YAY!! Anyways, nice post!! Love, love, love, love, love, love Anna. The sequel is really good, too. And you’ve gotta read Angelfall. It’s really fantastic. Oh great post ladies, I normally can’t stand anything creepy, especially the psychological thriller books or films that mess with your head for weeks afterwards. I’d rather have gore over that any day of the week. Out all of your recommendations, I’ve only read two books: Angelfall (which I loved) and Feed (which was an okay read for me, sorry Kate!) but I’m glad to see some recommendations up there which I’ve been itching to get around to reading, especially Between the Devil and the Deep Blue Sea and Anna Dressed in Blood, I know I’m always a late comer to books these days! Thanks for putting so many great reads on my radar! Hah hah, we are total opposites in our horror taste, Jasprit. :) Anna has plenty of gore, so I’d recommend you start with that one! Keertana, I bet you’d like MIDWINTERBLOOD. The writing is just…otherworldly, so literary and dark and beautiful. I’m pleased you’re a ALP and Diviners fan, too! JANE EYRE is one of my favorites, of course, and I’ve been meaning to read Mary Stewart forever. Angie over at Angieville has me convinced I’d love her gothic novels. I was actually going to add Wuthering Heights but I think I’ve used it in at least two of these favorites posts. I really enjoyed The Diviners as well. I love Gothic most of all — please try The Thirteenth Tale, Keertana! I second that–I loved Thirteenth Tale as well, and I think you would too, Keertana. I was gonna put Wuthering Heights, Rebecca, and The Turn of the Screw on my list, but I removed them in favor of some more recent releases. And Midwinterblood is mad creepy. Seriously. Anna is scary along the lines of the creepiest Buffy episodes. I still need to read: Anna dressed in blood, Another Little Piece, Between the Devil and the Deep Blue Sea, Unrest, Break My Heart 1000 Times, The Hallowed Ones, Angelfall, and The Waking Dark. I love Coraline! The passage was also really good and so believable :) I’m reading Feed at the moment and I like to so far. The cover from Cabinet of Curiosities is gorgeous! You know, UNREST doesn’t seem to be as popular here, and I barely heard anything about BREAK MY HEART 1000 times, either, except I think I recall that The Book Smugglers didn’t enjoy either one much. I thought they were both great ghost stories, though, and had some really nice spookiness. SO glad you’re reading FEED. That’s one of my all-time favorite series, too; didn’t include on my list because I interpreted the writing prompt as books that actually scared me, hah. And I need to read most of those books, too, but I’m so easily a-skeered! Happy Halloween, Dee! I was tickled to see K’s CORALINE rec, because I really liked the film but still haven’t gotten around to reading the book yet. I’ve had a copy forever, too. It really was creepy, wasn’t it? Her “other” parents really creeped me out.! I almost put Coraline AND The Graveyard book on my list, but that seemed like overkill. I’m so glad K had it on hers. My husband saw the movie four times in theater. YES. I was excited to see that Kate had it on her list, too. I want more people to read his books, his writing is just spectacular. Yes! I really enjoyed that book. One of the best written YAs out there. I’m now going to pick up that other he wrote (forgot the name hee hee). I used the wrong cover on mine because I thought Wendy might put it on her list (I read it after seeing her review), and I wanted our collages to look different. ANNNNNNNAA. You better not make her angry! Loved Heart Shaped Box, Affinity, and Anna Dressed in Blood. House of Leaves was a total trip. Great picks. So many more I still need to read! I remember when you read AFFINITY, Bonnie, I was so excited about that. :) I hope you get to THE LITTLE STRANGER sometime soon, too! I still need to read HEART-SHAPED BOX, your review was the first time I actually remember reading about that book. Bonnie, I have read so few of the books on the other ladies’ lists. And I’m pretty easily creeped out, so I will probably continue to avoid most of them. Affinity and Anna are awesome, though. Yay! Then our job here is done, hee hee. Happy Halloween all! Your new spookified profile pics gave me a fright! I have been hearing about House of Leaves for years, and I know I have to experience it sometime soon. Undead looks like my speed- I can do scary funny. Another Little Piece and Between the Devil are two more I’ve had my eye on. Happy Halloween, Lucy! We all look DREADFUL and I love it. UNDEAD is awesome–the dialogue is so smart and funny, and you just can’t help but laugh at the whole thing. ALP and DEVIL are both kind of tricky recs, because the writing style is so different! But I hope you enjoy them when you get to them. I picked up House of Leaves and leafed through it (no pun intended) and was literally gobsmacked and confused, so I put it down. It is one my goals though so I’ll get to it someday. I like your avatar, too! It’s hard to see all the blood dripping down your smiling face in the collage, though. Undead is such fun. Love love love. And Wendy really killed it with our avatars. I, like K, think mine is the best. The gross veins really kick it over the top. I know, those…things hanging in the trees in ANGELFALL made my mouth drop open. I bet if you love that and Anna you’ll really enjoy HALLOWED ONES, Eunice. It’s not as graphic but there are some nicely shivery moments! I need to read so many of these books. Anna, Hallowed Ones (which I vaguely remember Wendy recommending to me…I’m taking note now) and Angelfall!! I wouldn’t have guessed that one would be classified under creepy but that just makes me more interested. 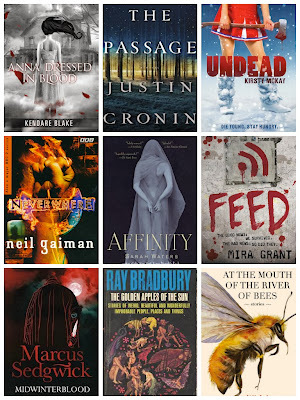 It didn’t even occur to me to put Angelfall on the list, but that book scared the poo out of me. And I haven’t gotten around to THO or ALP, either, although I believe I have them on my Kindle.